Oniomania (compulsive shopping, or what's more commonly referred to as shopping addiction) is perhaps the most socially acceptable addiction. Think about it: We are surrounded by advertising that tells us that buying will make us happy. We are encouraged by politicians to spend as a way of boosting the economy. And, for some of us, there is an allure of wanting what everyone else seems to have. Consumerism, by our own intentions or not (or some combination), has become a measure of social worth. Shopping addiction is a behavioral addiction that involves compulsive buying as a way to feel good and avoid negative feelings, such as anxiety and depression. Like other behavioral addictions, shopping addiction can take over as a preoccupation that leads to problems in other areas of your life. Almost everyone shops to some degree, but only about 6 percent of the U.S. population is thought to have a shopping addiction. Usually beginning in one's late teens and early adulthood, shopping addiction often co-occurs with other disorders, including mood and anxiety disorders, substance use disorders, eating disorders, other impulse control disorders, and personality disorders. Some people develop shopping addiction as a way to try and boost their self-esteem, although it doesn't tend to be very effective for this. Although widespread consumerism has escalated in recent years, shopping addiction is not a new disorder. It was recognized as far back as the early nineteenth century and was cited as a psychiatric disorder in the early twentieth century. Despite its long history, shopping addiction is controversial, and experts, as well as the public, disagree about whether shopping addiction is a real addiction. People who struggle with shopping addiction typically spend more time and money on shopping than they can afford, and many get into financial problems as a result of their overspending. Shopping addiction can involve both impulsive and compulsive spending, which produce a temporary high. That said, people who are addicted to shopping are often left feeling empty and unsatisfied with their purchases when they get home. As with other addictions, shopping addiction is usually a way of coping with the emotional pain and difficulty of life, and it tends to make things worse rather than better for the shopper. So what is the difference between normal shopping, occasional splurges, and shopping addiction? As with all addictions, what sets shopping addiction apart from other types of shopping is that the behavior becomes the person’s main way of coping with stress, to the point where they continue to shop excessively even when it is clearly having a negative impact on other areas of their life. 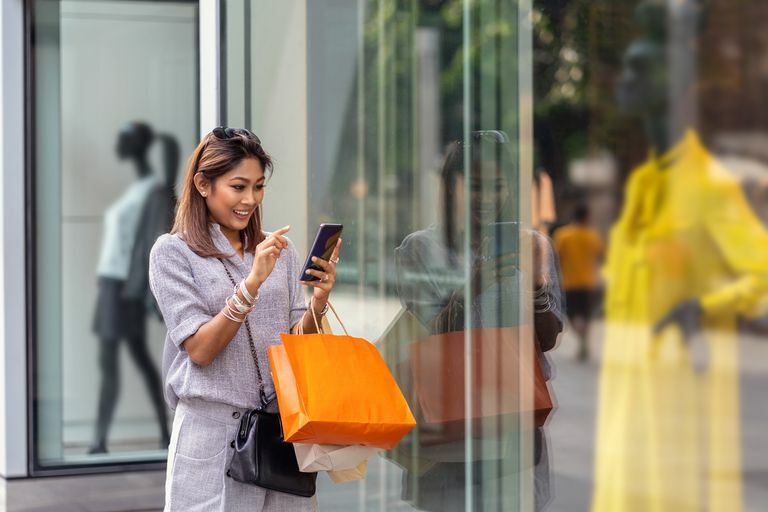 As with other addictions, money problems can develop and relationships can become damaged, yet people with shopping addiction (sometimes called "shopaholics") feel unable to stop or even control their spending. This difficulty in controlling the desire to shop emerges from a personality pattern that shopaholics share, and that differentiates them from most other people. Often low in self-esteem, they are easily influenced, and are often kindhearted, sympathetic, and polite to others, although they are often lonely and isolated. Shopping gives them a way to seek out contact with others. People with shopping addiction tend to be more materialistic than other shoppers and try to prop themselves up by seeking status through material objects and seeking approval from others. They engage in fantasy more than other people, and—as with other people with addictions—have a hard time resisting their impulses. As a result, they are more susceptible to marketing and advertising messages that surround us on a daily basis. While advertising, in general, is designed to exaggerate the positive results of purchase and suggest that the purchase will lead of an escape from life's problems, certain marketing tricks are designed to trigger impulse buying and specifically target the impulsive nature of people with a shopping addiction. People who gain pleasure and escape negative feelings through shopping sometimes call it "retail therapy." This phrase implies that you can get the same benefit from buying yourself something as you would from engaging in counseling or therapy. This is an incorrect and unhelpful idea. While the term retail therapy is often used in a tongue-in-cheek manner, some people, including shopaholics, actively make time to shop simply as a way to cope with negative feelings. Although there are circumstances when a new purchase can actually solve a problem, this is not typically thought of as retail therapy. Usually, the things that people buy when they are engaging in retail therapy are unnecessary, and the corresponding financial cost may actually reduce resources for solving other life problems. Online shopping addiction is a form of internet addiction, and people with social anxiety are particularly vulnerable to developing this type, as it does not require any face-to-face contact. Like other cyber addictions, it feels anonymous. What's the Difference Between Compulsive and Impulsive Shopping? Impulse buying is an unplanned purchase that happens on the spur of the moment in reaction to the immediate desire to have something you see in a shop. Impulse buying is a little different from compulsive buying, which is typically more pre-planned as a way of escaping negative feelings. But again, people with shopping addiction may engage in both types of addictive buying. Learn more about the difference between compulsive and impulsive shopping. Like other behavioral addictions, shopping addiction is a controversial idea. Many experts balk at the idea that excessive spending is an addiction, believing that there has to be a psychoactive substance that produces symptoms, such as physical tolerance and withdrawal, for an activity to be a true addiction. There is also some disagreement among professionals about whether compulsive shopping should be considered an obsessive-compulsive disorder (OCD), impulse control disorder (like kleptomania, or compulsive stealing), mood disorder (like depression), or behavioral addiction (like gambling disorder). How Is Shopping Addiction Like Other Addictions? There are several characteristics that shopping addiction shares with other addictions. As with other addictions, people who over-shop become preoccupied with spending and devote significant time and money to the activity. Actual spending is important to the process of shopping addiction; window shopping does not constitute an addiction, and the addictive pattern is actually driven by the process of spending money. As with other addictions, shopping addiction is highly ritualized and follows a typically addictive pattern of thoughts about shopping, planning shopping trips, and the shopping act itself, often described as pleasurable, ecstatic even, and as providing relief from negative feelings. Finally, the shopper crashes, with feelings of disappointment, particularly with him/herself. Compulsive shoppers use shopping as a way of escaping negative feelings, such as depression, anxiety, boredom, and anger, as well as self-critical thoughts. Unfortunately, the escape is short-lived. The purchases are often simply hoarded unused, and compulsive shoppers then begin to plan the next spending spree. Most shop alone, although some shop with others who enjoy it. Generally, it will lead to embarrassment to shop with people who don’t share this type of enthusiasm for shopping. Research indicates that around three-quarters of compulsive shoppers are willing to admit their shopping is problematic, particularly in areas of finances and relationships. Of course, this may reflect the willingness of those who participate in research to admit to having these (or any) problems. Shopping addiction is hard to live with because we all need to shop to some extent. If someone else in your family can take responsibility for shopping for essentials, such as food and household items, it can help to delegate the responsibility to them, at least temporarily while you seek help. It is a good idea to get rid of credit cards and keep only a small amount of emergency cash on you, so you can't impulse buy. Shopping only with friends or relatives who do not compulsively spend is also a good idea, as they can help you to curb your spending. Finding alternative ways of enjoying your leisure time is essential to breaking the cycle of using shopping as a way of trying to feel better about yourself. Overcoming any addiction requires learning alternative ways of handling the stress and distress of everyday existence. This can be done on your own, but often people benefit from counseling or therapy. In the meantime, there is a lot you can do to reduce the harm of compulsive spending and get the problematic behavior under control. Developing your own spending plan can be a good first step. Fortunately, although not yet well-researched, compulsive shopping does appear to respond well to a range of treatments, including medications, self-help books, self-help groups, financial counseling, and cognitive-behavioral therapy (CBT). Some of the personality characteristics found in the "shopaholic" personality bode well for the ability to be able to develop and respond well to a therapeutic relationship, which is the best predictor of success in addiction treatment. It should be noted, however, that although some medications show promise, results are mixed, so they should not be considered a sole or reliable treatment. If you believe you may have a shopping addiction, discuss possible treatments with your doctor. If your doctor doesn't take your shopping problem seriously, you might find a psychologist more helpful (and you might reconsider your relationship with your physician all together). Getting help in understanding the emotional roots of your shopping addiction, as well as finding ways of overcoming your tendency to use shopping to cope, are important aspects of recovery from this confusing condition. Your relationships may have suffered as a result of your over-shopping. Psychological support can also help you make amends and restore trust with those who may have been hurt by your behavior. You may also find that therapy helps you to deepen your relationships by leading you to better understand how to connect with other people in ways that don't revolve around money. Depending on how serious your shopping addiction is, you may also find it helpful to get financial counseling, particularly if you have run up debts by spending more than you earn. You could make an appointment with a financial advisor or consultant at your bank to discuss options for restricting your access to easy spending, to explore strategies for paying off bank debts and bank charges, and to put money into less accessible savings accounts as a way of interrupting the easy access to cash that tends to fuel the addiction. Shopping addiction can be as distressing as any other addiction. But there is hope, and support from those around you can help you to control your spending. Remember, you are a worthwhile person, no matter how much or how little you own. Black, D. “Compulsive Buying Disorder: A Review of the Evidence.” CNS Spectr. 12(2):124-32. Feb 2007. Christenson G, Faber R, de Zwaan M, Raymond N, Specker S, Ekern M, Mackenzie T, Crosby R, Crow S, Eckert E, et al. “Compulsive buying: descriptive characteristics and psychiatric comorbidity.” J Clin Psychiatry.55(1):5-11. Jan 1994. Lejoyeux, M.D., Ph.D., M., Ades, M.D., J., Tassain, Ph.D., V. & Solomon, Ph.D., J. "Phenomenology and psychopathology of uncontrolled buying." Am J Psychiatry, 153:1524-1529. 1996. Mueller A, de Zwaan M. “Treatment of compulsive buying.” Fortschr Neurol Psychiatr. 76:478-83. Aug 2008. Tavares H, Lobo D, Fuentes D, Black D. “Compulsive Buying Disorder: A Review and a Case Vignette.” Rev Bras Psiquiatr. 30 Suppl 1:S16-23. May 2008.